TMJ pain is frustrating and most uncomfortable. The rigidity of tempormandibular joint the severe pain as well as the sensation that upper and lower jaw not fitting well with each other causes panic. Though there are many causes for TMJ, stress is the most common cause. Experts say exercise is the best solution to improve the flexibility of the joint especially a few yoga postures are very beneficial for treating TMJ pain. Described below are some useful yoga postures for the same. Head tilt is the simplest yoga poses for treating TMJ pain. Simply sit straight on the floor and reach your left arm to the opposite side of your head and gently tilt the head. Make sure your left ear touches the shoulder. Bring your head back to the original position and repeat the same with your right hand. Hand clasping posture helps you relax and relieves neck and TMJ pain. Sit on the ground with your spine upright. Grasp both your hands at your rear side. Try to touch the palms of both hands with each other. Take a deep breath and stretch your arms behind. You can see many kids doing this without knowing its importance. It is very good for TMJ pain. Keep your sternum lifted and start tucking your chin towards your sternum and inhale. While you exhale, extend the backside of the neck. This posture prevents hunching and helps maintain correct body position. Thus, it helps reduce pain. Lie on your stomach and spread your feet and arms. Your body should be in the form of the alphabet ‘X’. When you exhale, lift your extremities as much high as possible and inhale. Return to original position and repeat the same for 10 times. This posture makes TMJ muscles stronger and improves blood circulation. Lie straight on the floor and slowly lift both your legs up with feet turned upwards. Lift your hips too and support the body weight on shoulders and neck. The legs should be perpendicular to neck. Hold this position for a few minutes and return back to the original position. 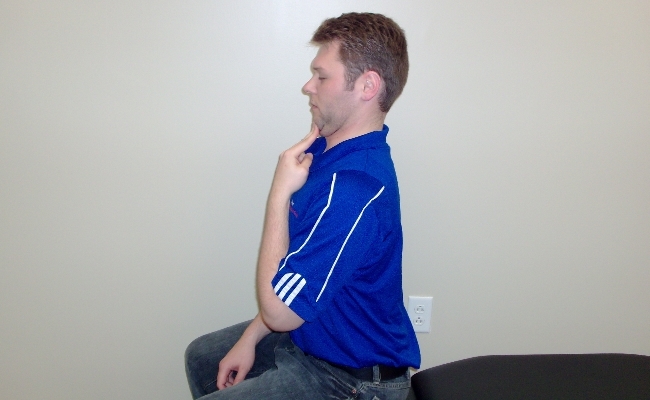 This posture improves blood circulation to TMJ region and reduces pain. Place your hands and legs on the floor and make a table like posture. Slowly lift your torso by straightening your knees. Your head should touch the floor. Hold this position for 3 minutes and return back to the normal position.